Drag and drop a ball over the tools to produce the required ball physics in each level. The cog factory has cut back on it's workforce leaving only you in charge of sorting all the cogs used to make their 'machine'. Your objective is to group the same colored cogs together in sprocket spirals. Once three or more cogs of the same color are adjacent to one another, they will connect themselves to the 'machine' in the background. The number of sprocket spirals increases as you progress through the game and the 'machine' gets built. Think carefully about which cog you send down which spiral - plan ahead. You only have a limited time before the cogs get ejected from the cogregator - so think quick! Look out for power-ups they'll help you when you need them most. Arrow keys. Space to launch the cogs. Questy would do anything for gold. In this case that anything happens to be risking life and limb in a dirt maze against arrow traps, spikes, ogres, and evil black knights. 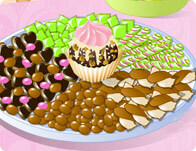 Try to separate bad boxes from boxes with candies. The aim is to build a road linking the starting point to the end point in order to get your vehicle across. As the game progresses, the objects in your path will become more and more complicated. Gems are precious to behold but hard to grab. Help bob Weave his electro claw through different puzzling levels full of twists and turns and collect all the gems in the right order. Problem with green ghouls haunting the inner catacombs of your mind? The solution is the same now as its ever been, throw them into the fire. Don't let Red Star fall! Put it on the platform as fast as you can, and prove your skill. Eat as many sea creatures as you can. Figure out how to wake the royal family peacefully by placing blocks in key places. A fun and challenging game for all ages. Fart your way through challenging puzzle levels.